Yesterday I wrote about how Apple just released the iOS 4.1 beta to developers in the iPhone Dev Center. 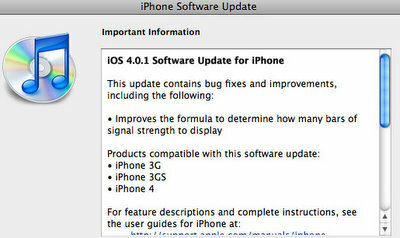 Well, about 24 hours later and the iOS 4.0.1 (notice the extra 0) is now available in iTunes to update your iPhone. As Apple mentioned in their July 2nd press release concerning the iPhone 4 signal strength, they said that the problem with the signal strength dropping was a mis-calculation in the bar display and how it represents actual signal strength the iPhone is receiving. We should know more tomorrow when Steve Jobs holds a special iPhone 4 press conference at 1Pm EST (10am PST).